Normally when it comes time to come home after being away for a week or two, I'm ready; I miss my kids, I miss my bed, I miss my life. This time I was torn between wanting to come home, to freeze, or stay there and stay warm! What settled it for me? I missed my Joy! Don't get me wrong, I love my kids and I missed both of them, but I've known them for 18 and 20 years respectively, and the new has kinda worn off. They just don't do anything cute anymore, ya know? We spent most of the week spending time with Derek's Dad, with a few trips into Tucson. I went to Grandma's Spinning Wheel, Unique Designs by Kathy, and the Tucson Yarn Company. Derek paid visits to two cigar shops, and on the final trip to town, we went to see Harry Potter, the Deathly Hallows, Pt 1. Kinda wish we'd waited, its going to be a long year waiting for the second half. It is a very good movie! 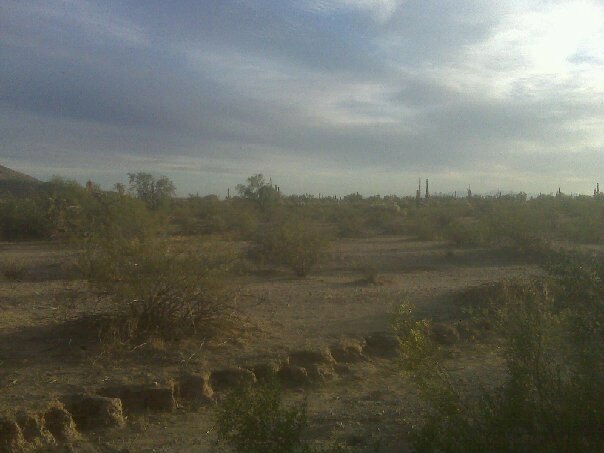 Here are a few shots uploaded from my camera to Facebook while I was gone, the first is an area between Florance, Catalina and Picacho Peak that is all for sale. I'm sure it will all get developed soon, although it would be great to get a piece of land here to settle on. Derek and I have been thinking about where we're going to go after he retires, its a ways down the road but its fun to think about. 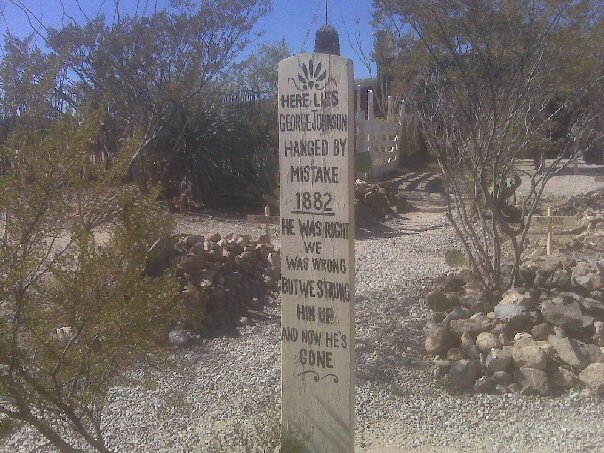 We went to the town of Tombstone, and to be honest (maybe it was the wrong time of year? ), it wasn't all that. 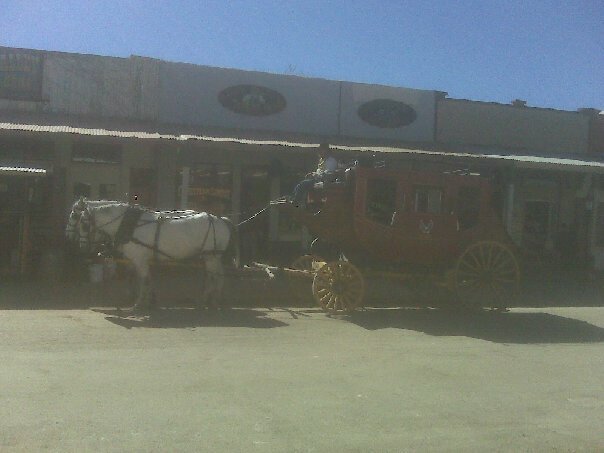 There are a lot of shops, more restaurants in two square blocks than seems necessary, a stage coach that sits in the middle of the road (those horses look so bored, don't they?) and goes for the occasional trip-d-trip around the block, a trolley car (I think it would have been fun but Derek didn't want to ride it), and the gun fight at the OK Corral every day at 2PM and every half hour after that. We didn't go to the OK Corral, they wanted $10 per person, and we decided we'd seen it enough times already in the movie. 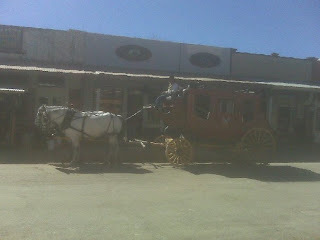 We wandered around, then went and had lunch at Big Nose Kate's (Kate was Doc Holliday's 'girl friend'). Then we left. But I'm bringing the cart before the horse as they say... Before you actually get to Tombstone, you have to drive past Boothill. 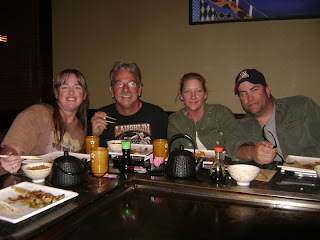 On the way home we stopped in Pahrump to visit and have dinner with my brother David and his wife Lisa. 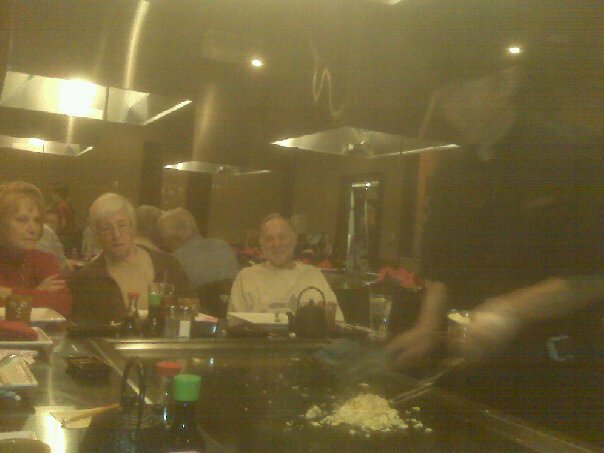 They met us at Ohjah's Japanese Steakhouse and Hibachi Grill. So fun! After much good food and more good visiting, Derek and I set out for home, which at this point was about 5.5 hours away. I had been trying to talk Derek into staying over somewhere because I knew it had been snowing at home all day Sunday and half the night before. To get home we have to go over a pass (Austin Summit) that sits at about 7900 feet; thats about 3500 feet higher than Battle Mountain. This pass is always treacherous in the winter time so I was worried. But he was driving. We got through the Smokey Valley OK, not very much snow there but as soon as we hit the pass things got dicey. From there Battle Mountain is about 110 miles north. Three hours later we drove into Battle Mountain. A very edge of your seat drive. So glad you made it home safely! Yesterday I watched a program on Wyatt Earp, which of course included a lot about Tombstone. It was very educational! I hear ya. I told Ian that I'm beginning to understand why so many New York Jews live in Miami. Our winter wasn't always like this so I can't help wonder if this won't just be another cycle. I hate to be hot more than I hate to be cold so I'm gambling on sitting tight.